So I finally got my hands on Reflections 2008: The NHL Hockey Year in Photographs today. After flipping through the 160 pages of some of the most amazing hockey photography you will ever see, I have decided I need to go back down to the bookstore and get a second copy! Why would I would want two copies of the same book? Because I want one to proudly display on my coffee table and share with guests. And I want a second copy so I can cut out the pictures, frame them and display them proudly on the walls of my hockey room. The photos are just that amazing. I think my favorites have to be the cover image featuring the outdoor game, Eric Staal's determination on page 45, Joffrey Lupul's jump of ecstacy on page 122, and most of the body check action shots, especially Dion Phaneuf getting a taste of his own medicine on page 59 and Marc Staal stapling brother Jordan Staal on page 138. The photos capture the highlights of the 2008 season, starting with NHL Premiere in London and working its way through to the awarding of the Stanley Cup champions. Along the way there are some great memories to relive. All without words. That's right, there are no words once the photos start. In 2007, the first of what I sincerely hope is truly an annual publication, I commented on how it might have been nice to have captions with the photos. But again they are tucked into the very back of the book. Hey, it's a pretty nitpicky complaint to have for this truly spectacular book. 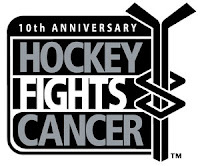 And the best part is that part of the proceeds from sales of this book are donated directly to Hockey Fights Cancer, a joint charity initiative undertaken by the National Hockey League and the NHL Players’ Association. 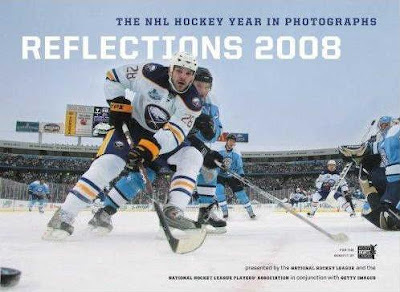 See, now you have even more reason to go out and buy Reflections 2008: The NHL Hockey Year in Photographs. It's an amazing book that truly is worthy of your coffee table space. And you are helping to make a difference and fight cancer too. Maybe you should pick up two copies.